Not exactly news. He's a mercenary, a killer-for-hire, really, and although he isn't evil, his morals are far more... stretchy than most of the Marvel heroes. I kinda like it, because it means they're not all cookie-cutter characters. It also adds an element of tension: not all the heroes believe in the same things, and they can get caught up fighting each other. 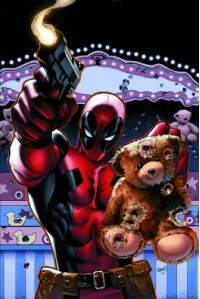 And as they track down the men who set Deadpool up, they have to unravel why. And also try not to let Punisher kill Deadpool for doing stuff he didn't do, because Castle doesn't believe Deadpool was set up at first. It's good. I flew through this, but I missed some good Spideypool action - I am quickly starting to ship them - and I felt like it didn't really have any meaning or impact. It was just a quick story to pass time. Other Deadpool stories spoke more to me, but at least this one amused me more than the last few. So I ended up going with four stars for the enjoyable factor, and deciding that was fair: it could have been a bit better, had more of a point, but it was an excellent way to pass some time today.